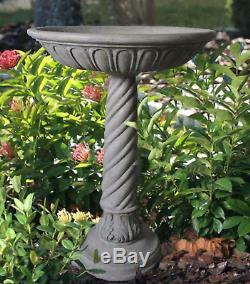 Stone Bird Bath Outdoor Yard Aged Antique Granite Finish Garden Handcrafted Bowl. This exclusive, handcrafted deep bowl birdbath with swirl base allows you to pause and enjoy your feathered friends in your own garden. 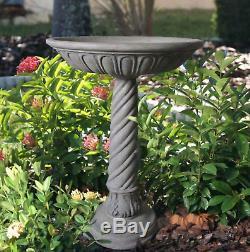 Constructed of a blend of natural stone, resin and fiberglass, the birdbath is lightweight, weather resistant and easy to assemble. The 85% crushed natural outer stone surface ages to a beautiful time-worn hue as it weathers. Cast using a blend of natural stone, resin and fiberglass. Lightweight, easy to move, weather resistant and easy to assemble. 3 components and simple assembly, no tools required. Wash with clean water and use brush if necessary to remove dirt. In cold weather, drain water to avoid possible outer surface damage. 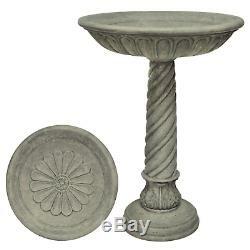 The item "Stone Bird Bath Outdoor Yard Aged Antique Granite Finish Garden Handcrafted Bowl" is in sale since Sunday, May 20, 2018. This item is in the category "Home & Garden\Yard, Garden & Outdoor Living\Bird & Wildlife Accessories\Birdbaths". The seller is "homegoodszone" and is located in Los Angeles, California. This item can be shipped to United States, Canada, United Kingdom, Denmark, Romania, Slovakia, Bulgaria, Czech republic, Finland, Hungary, Latvia, Lithuania, Malta, Estonia, Australia, Greece, Portugal, Cyprus, Slovenia, Japan, China, Sweden, South Korea, Indonesia, Taiwan, South africa, Thailand, Belgium, France, Hong Kong, Ireland, Netherlands, Poland, Spain, Italy, Germany, Austria, Israel, Mexico, New Zealand, Philippines, Singapore, Switzerland, Norway, Saudi arabia, Ukraine, United arab emirates, Qatar, Kuwait, Bahrain, Croatia, Malaysia, Brazil, Chile, Colombia, Costa rica, Dominican republic, Panama, Trinidad and tobago, Guatemala, El salvador, Honduras, Jamaica, Antigua and barbuda, Aruba, Belize, Dominica, Grenada, Saint kitts and nevis, Saint lucia, Montserrat, Turks and caicos islands, Barbados, Bangladesh, Bermuda, Brunei darussalam, Bolivia, Ecuador, Egypt, French guiana, Guernsey, Gibraltar, Guadeloupe, Iceland, Jersey, Jordan, Cambodia, Cayman islands, Liechtenstein, Sri lanka, Luxembourg, Monaco, Macao, Martinique, Maldives, Nicaragua, Oman, Peru, Pakistan, Paraguay, Reunion.